Today we have our first post from our February Guest Designer, Valliam! We are so excited to have Valliam designing with our products this month! 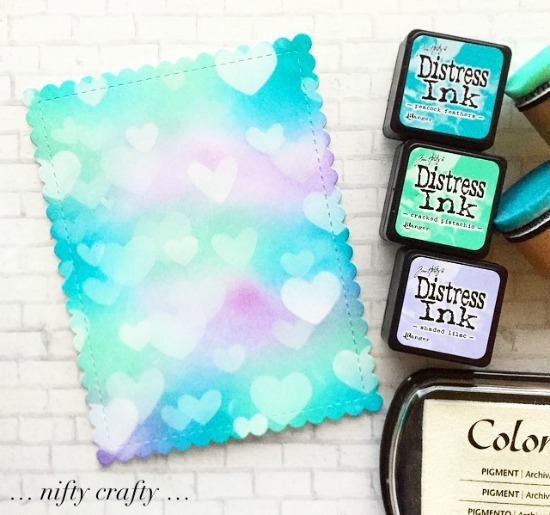 We fell in love with her amazing coloring and adorable cards and can't wait to share what she creates with our stamps! Keep reading to find out more about Valliam today and to check out her first project below! Hello everyone!! My name is Valliammai Valliappan and I go by the name Valliam in crafty world. I live in Bothell, Washington with my lovely family. I’m a STAH mom of two wonderful boys. I love anything colorful and crafty. I have always enjoyed making hand made cards and coloring since young. Now, it becomes my passion. I love to challenge myself to try out new styles and techniques. I enjoy being in my craft room, most happiest place and play with my crafts and supplies. It brings in a lot of positivity and contentment. Besides card making, I love cooking and photography. You can find more about me and my work at Nifty Crafty. I’m super excited and happy to be the Guest Designer for the month of love. Thank you so much for giving me this opportunity to shine in my passion even more. I hope you will enjoy my creations as much as I love making them. Hello all! I’m super excited to be the Newton’s Nook Guest Designer for the month of February. Huge thanks to the Newton’s Nook family for inviting me. As we are in the month of love, here I’m sharing a lovely Valentine’s Day card featuring Newton and his sweetheart from the newly released Newton’s Sweetheart Stamp Set. I love the images and cute sentiments on this stamp set. They are super adorable and perfect for the theme of love. 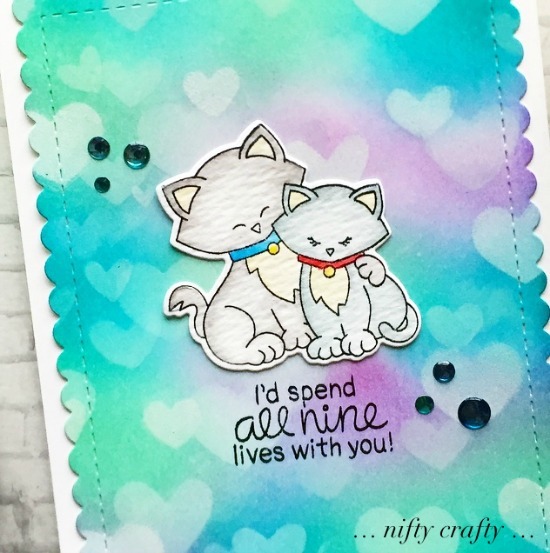 Once I’m done with the background card, I stamped the image of kitties on a Tim Holtz distress watercolor card stock and colored them using distress inks. I cut them out using the coordinating Newton’s Sweetheart Die Set. I adhered the image onto the background card and stamped on the sentiment from the Newton’s Sweetheart Stamp Set. Next, I adhered the final background card to the base card and finished off by adding some teal dimensional dots. That's all for today :) I hope you like this card! Have a great week ahead and I’ll catch you on next Monday with another card. I love the bokeh effect!! Looks so beautiful with the pretty ink colors you chose. Thanks for sharing! beautiful, the heart shaped bokeh effect is dreamy. Such a fabulous bokeh background,Valliam! Love the colours you chose to blend and the hearts are just so romantic. The perfect backdrop for the super cute kitties!